"I owe much to the Oxy experience." 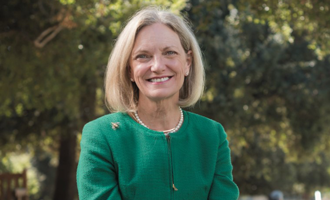 Susan Howell Mallory '76 M'78 is head of wealth management banking for Northern Trust and chair of the Occidental Board of Trustees. She has included Oxy in her estate plans through a beneficiary designation. The first time I walked on the Occidental campus, the Myron Hunt buildings took my breath away. The jacaranda trees were in full bloom, and every student I met was interesting, thoughtful, and positive about their Oxy experience. I was also impressed with how close the campus was to downtown Los Angeles and all that the L.A. Basin has to offer. After spending the first two years of college at a rural woman's college in the Northeast, I had intended on transferring to Scripps. That ended the minute I set foot on Oxy soil! A day does not go by which has not been influenced by what I learned or did at Occidental. I was exposed to all kinds of experiences which helped to form my independence from traditional norms and thinking. I learned how to contextualize, and not take what I read as fact but rather interpretation. I also learned to be more courageous and to listen to others to help form my positions and beliefs. I find that listening to and actually hearing others' perspectives provides a richness to one's decision-making and actions. I have many memories both in and out of the classroom, but it was in my Model United Nations class that I became passionate about global affairs. I also learned public speaking, debating, and the importance of negotiation. I played the role of the head of the People's Republic of China delegation, which was fascinating and was the impetus for me staying at Oxy and getting my master's in diplomacy and world affairs. At Oxy, I also learned to dialogue and to question data by seeking out the rationale underlying them. As a banker, I often find my self in discussions with analysts concerning numbers, trends, models. The story behind those numbers is where I often end up, not the sum of the parts or patterns. My connections with clients are not through performance metrics or industry trends, but rather through common interests such as reading, history, politics, global events, and other liberal arts-related topics. I owe much to the Oxy experience and helping to shape who I am. With the challenges that every small liberal arts institution has in competing with larger, well-endowed private universities and less expensive public universities, it is critical that all alumni support our institution in as meaningful a way as they are able. Making sure that Oxy flourishes and provides the highest quality education and experience to all students is a responsibility we all share. I hope you will support and get involved in the College.